Home Blog How to Connect Apple TV to a Television? The Apple TV was once the quieter product in Apple's lineup, but with the new Apple TV on the market now, it stands at the forefront. 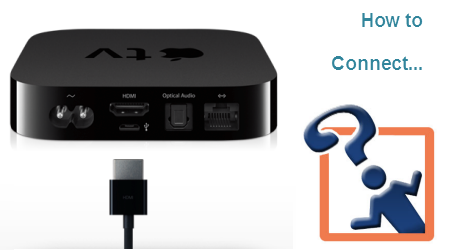 If you are planning to buy a new Apple TV, here is how you can set up and connect Apple TV to a Television. How do you connect the Apple TV models to a TV? Use the HDMI cable to connect the Apple TV and your HD TV. Insert one side of the cable into the HDMI port of the HD TV and the other side into the back of Apple TV. Connect the Ethernet cable with Apple TV (for wired connection). If you want to set up a wireless connection, Apple TV has built-in Wi-Fi. Insert the small end of the power cord into the Apple TV power port and the other side into an AC power outlet. Turn on your HD TV. A setup screen will pop up. Choose the HDMI port as input from your remote control. Choose the language through your remote control. Follow the onscreen instructions to connect your Apple TV to the wireless network. Select your wireless network from the list. If you cannot find your network on this list, enter the name of your network and its password. When you are connected to the Internet, sign into your iTunes account and browse, rent or buy from the huge library of HD movies. The collection also has many TV shows on offer. If you want to stream content from your iOS device to HD TV, you can do this through AirPlay wirelessly. There is another option called mirroring which projects your iPad or iPhone screen on your TV. You can also access multimedia files stored in your computer using Apple TV using the Home Sharing feature. Go to settings from the main menu and choose home sharing. Login with your Apple ID and password. Go to iTunes. Choose Home Sharing from the File menu. Switch on Home Sharing. Enter the same ID and password and you are done. You can easily access Netflix, Presto, Stan, or Quickflix on your TV with Apple TV. However, there are tons of potential advantages out there await you to exploit. For instance, when you download HD movie from internet in MKV format, then through converting MKV to Apple TV, you can watch a free movie on Apple TV. iFastime Video Converter Ultimate is one of the best video converting app for Apple TV. This video converter enables you to transcode SD/HD/4K videos in any format to Apple TV with its supported video audio format, parameter settings all matched in 6× faster speed and zero quality loss. Thanks to the built-in video editor, you can trim, crop and retouch your videos in clicks. Overall, this program is a completely professional Apple TV video converter, player and editor with which you can play any video format on Apple TV with less occupation regardless of video formats or codec. For mac users, here is the mac version. Then what if your own Blu-ray/DVD disc? Do not hurry. To get Blu-ray/DVD readable by Apple TV without paying a Blu-ray/DVD Player, you can also use iFastime Video Converter Ultimate to rip and copy protected Blu-ray/DVD to Apple TV MP4, MOV, M4V, etc. The output videos are compatible with iPhone, iPad, iPod and iTunes as well. Here are five common Apple TV problems and how to fix them so that you can get back to binge-watching your favorite TV shows without interruption. WiFi problems with the Apple TV are perhaps the most common to occur with the set-top box, especially since WiFi problems in general are far too easy to come across in the first place. With the Apple TV, it's possible that you could experience difficulty finding a WiFi network, unable to join a nearby WiFi network, connected to a WiFi network but unable to access content, or experience intermittent disconnects and general connectivity issues. To fix any of these problems, first navigate to Settings > Network and see if an IP address is showing up. If not, it could be that your router needs rebooted or the Apple TV itself needs rebooted. To restart your Apple TV, navigate to Settings > System > Restart. If your Apple TV can connect to WiFi, but the signal isn't very strong, it's possible that it's receiving a weak signal. Try moving the router closer to the Apple TV or vice versa, if you can. Most importantly, use ethernet whenever you can, as that will give you the best connection there is without the potential problems that arise when going wireless. AirPlay is a really popular feature with the Apple TV, and it's one reason that many users buy an Apple TV in the first place, but issues can easily arise when trying to use it. If you're having problems getting AirPlay to work between an iOS device and your Apple TV, make sure that both devices are connected to the same WiFi network, as this is what makes it work in the first place. If you're not seeing the AirPlay icon in the first place in an app, it's very likely that the app doesn't support AirPlay to begin with. You can also check to see if AirPlay is enabled on your Apple TV by heading to Settings > AirPlay and make sure that the feature is turned on. If you're having performance issues with AirPlay, like stuttering and lag, make sure that there's not another device on your network hogging up bandwidth, as this can be a huge culprit. Another common issue with the Apple TV is that trying to play streaming content doesn't work and there's no video or audio, or there could be audio but no video. One of the simplest things to do is make sure the HDMI cable going from the Apple TV to your television is plugged in snuggly on both ends. The Apple TV might also be set at the wrong resolution, which could cause the video to not display at all by default. To change the resolution that your Apple TV displays, navigate to Settings > Audio and Video > Resolution. It's likely set to Auto, but you can manually change it to the native resolution that your television support. Perhaps a very common audio problems is when there's video, but no audio playing, and it's really annoying when this happens. However, there are simple fixes for this. First off, check and make sure that all connections between your Apple TV and your television are properly plugged in. If you use an audio receiver, make sure that it's set to the right input (usually scrolling through the inputs while you play something will do the trick). And while this usually isn't the case, we have to mention it, simply because it happens: Make sure your volume is turned up and not set to Mute. You can't operate an Apple TV without the accompanying remote. If you're having issues with the remote, that's clearly a bad sign. Here's how to fix that. If the Apple TV doesn't respond to commands from your remote, it's possible that the remote isn't paired with the Apple TV. If that still doesn't work, it's possible that the remote could be dead, so plug it in using a Lightning cable and let it sit for a while to charge up. Apple TV has been redesigned to be small in size but big on entertainment. With Apple TV, you can watch HD movies, stream content from different streaming services, listen to podcasts, access music and photos and watch your favourite sports. For instance, if you are a movie buff, you can buy, rent and stream movies. If you are interested in sports, you can subscribe to sports related channels to watch sports in glorious HD. Check out YouTube, Flickr and Vimeo for diving into the user generated content world. You can also listen to Internet radio channels and music. The possibilities are endless. Also you can play local media files from your computer on your widescreen Full-HD TV via Apple TV. Does Samsung TV support .avi files?